Check out all of our daily food specials. We deliver 11am-6pm every day. For delivery after 6pm contact Bitesquad, Grubhub, Doordash, or Postmates. Dinkytown's Original Burrito Joint and Watering Hole! "5 years later and I still have dreams of this place. I lived off of their burritos when I was in college." "This is our happy hour spot of choice. You can't beat the drink specials." "A burrito right?! Wrong. It's a freakin way of life. And they do it very well here!" We've been rated as one of the best Burrito places in Minnesota - come find out why! We have an amazing brunch menu served Saturday and Sunday from 10am-2pm. Find out more by checking out our menu. We have specials so good you'll be sure we're off our rocker. Order any mug of beer or large rail drink and get a FREE Chimichanga (that's a golden fried burrito) or Smothered Enchilada. Order a mug of beer or jumbo rail drink and get 3 free hard shell beef or veggie tacos. 20cent Bone In Progressive Wing Special with Drink percahse and team trivia. $1 for a side of Blue Cheese or Ranch. 4pm 20cent wings, 5pm 30cent wings, 6pm 40cent wings, and capping out at 50cent wings at 7pm going till 10pm. Free platter of nachos with any regular priced beer or margarita pitcher! 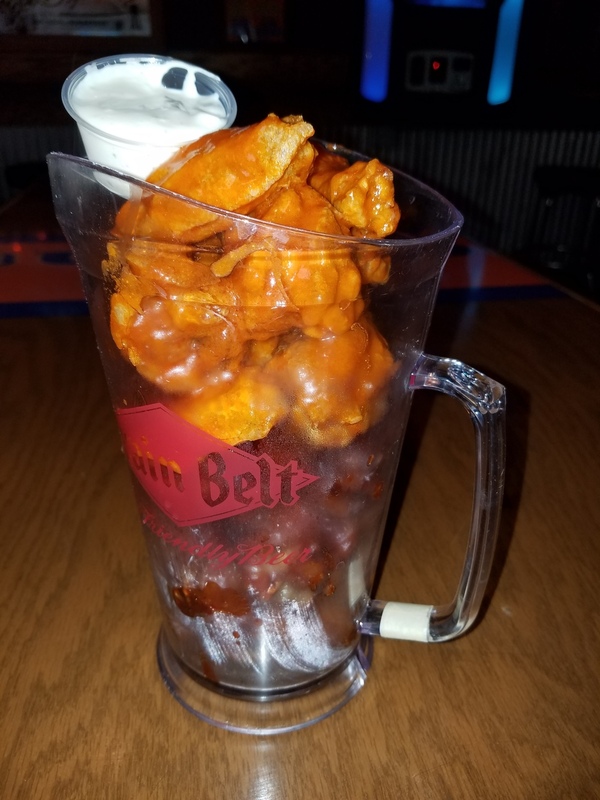 Plus .20 cent Boneless Progressive Wing Special with the perches of a drink! $1 for a side of Blue Cheese or Ranch. Specials subject to change during events. F.A.C. (Friday After class) 3-6 p.m.
Order a pitcher of beer or margaritas and get a Free Platter of wings. Buffalo, BBQ, or Plain. $3 Bloodies, Screwdrivers, Tap Beers, and Cocktails. All deliveries have a $ 10 miniumum - we deliver off our delivery menu 11am-6pm 7 days a week! After 6pm you can order delivery through Bitesquad, Groubub, Doordash, or Postmates. All the great stuff you want in a burrito but set on a bed of rice in a bowl. Chips smothered in queso cheese, then topped with choice of beans, meat, lettuce. Choice of salsa and sour cream. Chips and Mild Salsa come on the side for delivery. The salad version! Loose the shell of one of your favorite burrito ingredients on Romain lettuce in a bowl. A fried crispy burrito shell filled with Romain lettuce, rice, your choice of meat with cheese, and choice of salsa, and sour cream. Taco Shell comes on the side for delivery. A fried crispy burrito shell filled with Romain lettuce, rice, bean choice, pepers and onlons, with cheese, choice of salsa and sour cream, with homemade Guacamole.